My friend Oksana died tragically in April 2001 at the age of 20. Whenever I hear this song, I think of her. Incidentally, I think that you can tell that the writers of this song and the director of the video read L.M. Montgomery's Anne books and watched the movie for inspiration! Our little one is doing much better today! The saline flushes that we've been doing every so often are really clearing his nose of the milk and he is breathing quietly and without struggling. I really think that since his nose is so much better, nursing has become easier, too. He nursed every two hours all night and was able to stay latched on each time he nursed for the majority of the feeding (in the past, he would latch on for a minute or two, then hop off and we've have to latch on again which was hard for him). I think that we are off to a great start!! Thanks for your prayers!
. :Pastries from the Greek Festival in Town:. Today was such a tiring day. Last night our little baby had a terrible time with snorting through his nose. At times it seemed like he couldn't breathe. At about 4:30am Father John and I made the decision to take him to the ER as a precaution. The baby and I arrived there at about 5:30 and because I thought he was having a breathing issue, we were whisked right in. He was given an IV, a catheter, and a blood draw. Fun times. After being there for hours, we were given a diagnoses of Reflux. They also suspected a small heart murmur after examining him. We were finally discharged and we headed home so that Father John could bless the start of the Greek Festival. While Father John was gone, I cleaned up the downstairs, Little Man threw up on the carpet (just his overactive gag reflex, Thank God), I fed the big kids lunch, nursed the baby, did some laundry, and got everyone down for their naps (a small miracle!). Father John came home, filled out the banking for me to drop off at the bank, and we were back to the hospital for an echo cardiogram scheduled for 1pm. Fortunately, the sonogram of the baby's heart seems to be okay. We'll get the full report in a little while from our regular pediatrician. The baby is resting peacefully now that we flushed his little nose with saline. The best thing to come out of today is that it is recommended that he eat small meals frequently. That means no more bottles and pumping! I am a little nervous about stopping the bottles because I want him to keep growing quickly, but I will follow the advice. He is a lot stronger than he was when we first attempted going bottle-free, so hopefully things will go well this time. We found this amazing toad clinging to the siding on our house. He jumped from the house to the porch floor and changed from beige to gray blue. Now he is hanging out in our neighbors clear frog house on our counter and has changed to match the counter! We will set him free soon, but we are enjoying the impromptu science lesson! Our master bedroom is on the first floor of our home. We are very fortunate that the bedroom has a sizeable closet in the room, but unfortunately, it is also directly in view of the rest of the house and it is the only closet on the ground floor! For awhile now, I have wanted to add a second tier of shelves to the closet so that we could store more and have things look neat when the closet is inevitable opened in front of guests. We finally got a hair cutting kit and were able to cut Little Man's hair. He looks like such a big boy now! For awhile now, I have wanted to buy a Movable Alphabet for Sugar Plum. Though they are not terribly expensive and I would get a lot of use out of it since we have three children who will all need to learn the alphabet and how to spell and write, I have put it off. I was looking for something to occupy Little Man (who is very into little things lately) this morning, and I pulled out the Bananagram game that I bought for Fr John's stocking last Christmas. As our little guy was playing with the pieces on the carpet, it occurred to me that this game (that we have never played with!) was a movable alphabet! Since it is a word game, it has multiples of commonly used letters and is perfect for little ones to use! As a bonus, it is readily available in many stores (we got ours at Target). Father John was recently asked this question and he wrote the answer to it in this week's bulletin. I thought that some of you might find it interesting. Question: Why can’t girls serve in the altar? Answer: Great question! Especially for today when there is a tendency to confuse “equality” with “sameness” when looking at gender related issues. First, we have to say that just as apples and oranges are both equally fruits and they are not the same, so too men and women are equal but not the same. In the Church, men and women are equals in that both were created in the image of God and both are called to become like Him by being filled with the Holy Spirit. In Galatians 3:28, St. Paul even writes that “there is neither male nor female: for you are all one in Christ Jesus.” Please pardon the expression but when it comes to giving His grace, God is an “equally-opportunity lender.” Now, though God made men and women equal, He obviously didn’t make them the same. For instance, with the exception of Arnold Schwarzenegger, who had a baby in the movie Junior, men cannot give birth to children. Only women have been given the amazing opportunity to carry a child in the womb; nurturing it, caring for it, being in a very real sense “one” with the child in a way that fathers can never experience. Of course, this doesn’t make women better than men, just different. In a similar manner, though men and women are both equally part of the “royal priesthood” (I Peter 2:9), God has given the responsibility of the sacramental priesthood to men. Perhaps because a male priest more easily represents, the God-man, Jesus Christ, Who is the Great High-Priest. Or perhaps because the Lord chose twelve men to be His apostles. Whole books have been written on this subject, starting with the Scriptures themselves. But, honestly, when it comes down to it, we really don’t know why God has chosen men to be priests. All we know is that He has. Why did God make it so that women can bear children and men can’t? Who knows! All we know is that God made it this way. This is His world and His Church. And, by the way, thank God for that! And so, since women don’t become priests, the Church doesn’t train them behind the altar as servers. Girls usually apply their talents to other forms on ministry: in the choir, as church school teachers, caring for those in need, and perhaps most importantly, raising children in the Lord. I am reminded of the words of St. Theophan the Recluse, “Of all the holy works, the education of children is the most holy.” Finally, I will mention that in most women’s monasteries, where there are no men to assist the priest in the altar, the nuns fulfill this responsibility. Likewise, in most churches it is a woman – the Virgin Mary – who is depicted on the main wall in the altar above the Holy of Holies. She is depicted in this spot be-cause of both her great holiness as well as her special role in salvation history. After all, according to Church teaching, she not only entered the Holy of Holies as a little girl, but she also became the Holy of Holies, bearing the living God in her virginal womb. This is why of all the saints, men and women from every generation, she alone is called “full of grace”, “blessed by all generations,” and “more honorable than the cherubim, more glorious beyond compare than the Seraphim.” How did she achieve such heights? Because, like with the priesthood and pregnancy, this was how God ordained it, and she wholeheartedly embraced His will. What a great example for all of us - men and women alike! Do something unexpected and fun this weekend... make lemonade from real lemons, bake brownies (using a solar oven, perhaps? ), take a moonlit drive, catch lightening bugs, enjoy a leisurely picnic after church, swim... I'd love to know what you choose to do! "Little Mama" is doing well! She had her four-year-old check up on Thursday and we found that she gained three pounds (for a total of 29.9 lbs) and grew 2 inches (38.5 inches) since her last well child visit. She is still so petite (10th percentile for weight and 25th for height). She loves holding her baby brother for me and enjoys playing with Little Man. Some of her favorite activities are singing, drawing, listening to stories, roller skating, playing at the playground, and learning her letters. She likes looking at bugs (and will put them into a little bug house so that she can inspected them close up) and digging for treasure (rocks, flowers, leaves, and bits of old building materials) in the empty lot next to our house. She is a very loving little girl and though she was a late bloomer in the talking department, she has completly caught up and now talks almost non-stop! "DeeDee" (as he calls himself) is blossoming into a very nice little boy! He gave up his pacifier a few weeks ago and is really doing fine without it (though he asks for it occasionally). He loves running and jumping and wants to be a fireman in the worst way. Father John has a step ladder in the garage and Little Man likes to sneak out there and drag the ladder inside to use with the vacuum hose to pretend to put out fires. He is very imaginative and likes to play elaborate games with trucks, trains, and dress up clothes. Little Man is doing extremely well as a big brother. He is very gentle with the baby and helps me out a lot... he likes to get things that I need. He is not talking much yet, but he has recently begun saying "Hi, Baby" when he sees that his little brother is awake. He also likes to show the baby some of his favorite toys like his trains, flashlight, and fire trucks. I really need to think up a blogging name for our little one! He is growing so well! When I weighed him this morning, he weighed 6 lbs 12 ounces! We took him for his hearing appointment last week and he passed with flying colors! The next things to get checked is his eyes (in early August) and then he will have his regular two month well check. We are still giving him some breastmilk through a bottle several times a day. I was hoping to be finished with the bottles sooner (mostly for the selfish reason that I hate to pump), but he isn't ready. I am confident that he will breastfeed exclusively though. He does a great job when we nurse, but he just doesn't have the stamina to breastfeed 100% of the time yet. We've noticed that he is having more awake times lately... Thursday morning he was up for three hours in a row! That really tuckered him out though, because he only woke up to eat the rest of the day! We're having fun with our little trio! Every afternoon, we get into the big bed and take a nap. With the sun streaming in and warm babies on either side and my chest, we all sleep. When I was growing up, naps were a part of my family's routine and I've instituted them in our little family as well. Though the baby's routine isn't quite predictable yet, we're getting better at getting him to sleep when the big kids sleep. I am not someone who does well when low on sleep, so these naps are essential with a little one who wakes frequently during the night and older children who rise at 5 or 6. Do you insist on naptime in your house? What do you do with your older kids when they are too big to sleep in the afternoons? 1. Buy flowers for the table... for no reason at all! 2. Give myself a pedicure and tidy up my fingernails and hands. 4. Drink more ice water and garnish with a bit of lime. Once you have chosen five simple things, post them on your blog and let us know in the comments section. If you do not have a blog, but have a commitment to share, please post them in the comments section.I can't wait to read your Commitments to Loveliness! The Automobile: Blessing or Curse?
. :At the blessing of automobiles and bicycles today:. Few inventions have changed our modern world as much as the automobile. Being as fast as the wind it allows us to transverse great distances with ease. Dirt roads have grown into massive four lane highways, cities have expanded with populations commuting from the suburbs, and even the good old family vacation can now be to more distant places like beautiful beaches, mountains, and cities. True, the pessimist may argue that the invention of the automobile has also brought things like traffic, pollution, and even congestion to these places. Yet, that is to see the tank “half-empty”, and with the price of gas on the rise these days who really wants to do that? As an optimistic, “half-full” community, our church, sees the invention of the automobile as the tremendous blessing it is. Each summer, the church blesses not only cars, trucks, and motorcycles, but even children’s bikes and tricycles. Our church welcomes everyone, "half-empty" and "half-full" people alike, to come for the special blessing of automobiles which will take place on Sunday, July 18th, following the 9 o’clock service. May God Grant the Servant of God Gregory Many Blessed Years as He is Enrolled into the Catechumenate! I know that it is a little early to begin thinking about Dormition, but since it is only two weeks away for those of us on the New Calendar, I have been planning out some activities and ideas I'd like to do with our little ones during the fast and the feast. I am hoping to get a special candle to put on our table and light each evening as we eat dinner and keep lit afterward while we read from the Children's Bible or one of our other special books for this season. 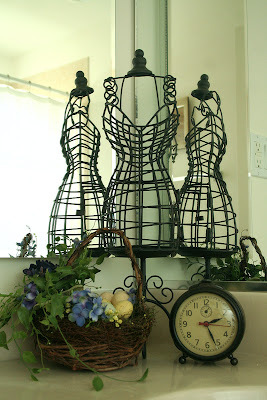 We did this last year and it was a big hit! In addition to coloring in a icon of the Dormition, I would also like to explain the icon to our daughter. I'd like to start singing the troparion of the feast with the children well before the feast is celebrated. Sugar Plum is starting to really remember the words to songs and I would like to capitalize on that and have her learn the troparion so that she can sing along in church on Dormition. Though I don't have pictures of our Dormition feast day shelf from last year, normally we include an icon of the feast (you can use the colored in icon that your child did, a book about the feast, or a framed printout from the computer if you don't have one of Dormition), fresh flowers, and anything else you'd like. It is such a nice tradition to take your little ones to the market the day before the feast to choose a bunch of flowers to be blessed at Liturgy the next day. You can help them to arrange the flowers in a vase, and have them bring the blooms into the church. Once the flowers are home, the children can choose where to display them. You can also offer a bouquet to a neighbor who isn't Orthodox and explain the significance of the special day to them. The Liturgical color of the Feast of Dormition is blue. If your children have clothing that is blue, you can have them wear it on the feast. If not, allow them to choose their nicest outfit to wear to Liturgy to honor the Mother of God. Several years ago, we planted a Mother of God Garden. It was a lot of fun! 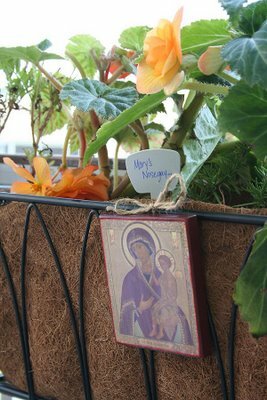 I'd like to put together a container garden with the children full of plants that were named after the Theotokos. We'll probably keep it relatively small in scale so that we can enjoy the plants on a table. On the feast of Dormition (August 15th), plan a special day! Enjoy the Divine Services, serve good foods, do something together as a family, etc. Make the feast a day to remember. It is easy to make feasts like Christmas and Pascha (Easter) special, but we forget that each of the Twelve Great Feasts of the Church are supposed to be days that we celebrate! I've been reading the blog Habit for awhile now and was excited to participate in their eighteen month anniversary invitation for their readers to submit their photographs to their flickr group daily for the month of July. Though I've missed a few days, I've been trying to snap a picture and upload it before the day is out. I didn't expect to get featured on their blog since everyone submitting photos is extremely talented, but today I was excited to see that they chose my picture from last night for today's post! Wow! We're only halfway through the month... why don't you join in? Our insurance company has a new program to help parents of premature babies. Not only do they provide helpful information on caring for an infant, but they have a NICU nurse that contacts us every so often to see how we are getting along (she has even asked about how our older children are coping and how I am feeling). She sent me a packet today on monthly milestones we can expect and also on stress signals the baby might be sending us. 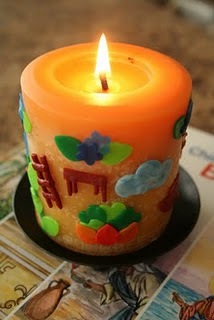 In addition, she sent a sheet listing things that we can do to reduce stress in his little life. As I read this list, it occurred to me that we could all benefit from a home that provides these things (soft lights, quiet, a calm atmosphere, organization, limited clutter, and gentleness). I know that it isn't always possible to keep a peaceful atmosphere in our homes, but a lot of it has to do with how the adults conduct themselves. There is a huge difference in our home when I am running trying to get too many things done, panicking at the slightest setback and when I am moving around calmly doing what I can to keep things going smoothly and happily in our home. What do you do to cultivate a peaceful, calm, and happy home?
. :Breakfast with My Little Man:. Yesterday we received this gorgeous blanket from Matushka Anna in honor of our little one's birth! She made it especially for his baptism! Can you believe that she made up the pattern all by herself? She is so talented! We all think that she should start selling these. This blanket will definitely be a heirloom in our family and I cannot wait to wrap our baby in this beautiful, beautiful blanket on the day of his baptism! Thank you Matushka! By the way, if you aren't Orthodox and are wondering why the cross in the blanket has three bars on it, here's an article with an explanation that I posted last March. The South of France, from Provence to the Cote d'Azur, is know the world over for its elegance. Home of the troubadours in the Middle Ages, it is still today a land of grace and poetry. In fact, medieval minstrels from this region are credited with glorifying the romantic love in epic poems retelling how chivalrous knights wooed virtuous and noble ladies. back then, Provence was much more civilized than the northern part of France , and Aix was considered a more sophisticated capital than Paris. The rivalry between the two cities is legendary. Though Paris is the Capitol of fashion in the winter, during the summer, and particularly August, Aix is the place to see and be seen. The women look like they have strolled out of a 1930 Lartigue photograph: Their attire is timeless yet surprisingly modern, adapted to the weather, the season, and the activity of the moment. The women of Provence have always inspired me with their incredible sense of style. It's a look of supreme simplicity that my most stylish clients have embraced well. I don't know if it's the light or the lifestyle, but on the streets of Aix you'll rarely see a woman wearing too much makeup, flashy clothes, an armful of gold jewelry, or tons of hairspray. It just doesn't happen. A Pale Cotton Shirtdress with leather mules, or even flip-flops. A great manicure and pedicure. A neat ponytail. Ballet Flats with Capri pants, a straw basket in hand. A chic bob, tucked behind the ears, with long bangs. A Simple Strappy Top, a slim wrap skirt, hair held in place with a single braid. Ah, braided hair! How cool and romantic. A Striped Top with natural linen slacks. Sunglasses casually propped on the head, like a headband, with a few strands of hair falling down. Light Canvas Pants, a blue plaid or crisp white cotton shirt, a rope belt, espadrilles, and a straw Panama. A Cotton Dress with a pashmina scarf, worn with pretty espadrilles. It looks even better if you carry a loaf of bread and bouquet of flowers! But these fashion tips won't work unless you add a final personal touch: a taste for the unexpected combined with a sense of whimsy. Needless to say, this isn't something that can be dictated. The only way to learn it is by observing how others do it. This is why Aix people spend so much time sitting at the terraces of cafes, sipping lemonade, watching the continuous parade of chic local residents, dapper out-of-towers, colorful international tourists, and in-the-know students. Today, I stumbled upon a new-to-me blog, MaiTai's Picture Book, where the author regularly posts the way that she accessorizes her simple clothes with a scarf, jewelery, and handbag. I particularly love the fact that she has a series where she mixes and matches 22 pieces of clothing to make different outfits by spicing things up with accessorizes! Other than the nursing situation, everything is going very well (and even that is totally normal for a baby of this age and size)! Most of his day is spent sleeping, but we noticed today that he was awake in the afternoon for over an hour. He was checking everything out and visiting with his big sister and big brother. It was pretty cute! It is so hard to believe that my forty days ends next week (the 15th of July). We still plan on keeping our little one home as much as we can until his baptism. Though most Orthodox Christians try to baptize their children on or around the 40th day, we are going to postpone it until he is about 8 pounds (I am guessing that will be around the end of August or beginning of September). We did this for Little Man and felt that it was an easier day for him than Sugar Plum's baptism was for her (she was only about 6 pounds and so very tiny!). We have a hearing appointment scheduled for next week. This is just a precaution since his hearing seems normal, but we'd appreciate your prayers! I'll update you when we get the results! I've been a little obsessed with Nikki McClure's illustrations lately (isn't Mimi lucky to live near her?) . I first saw her book, Mama, is it Summer Yet? at a little bookstore near the ocean and we were all so excited when we eventually bought it. 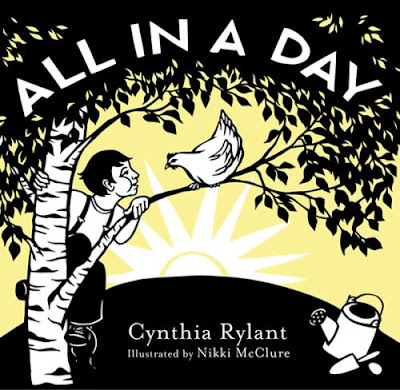 I ordered a copy of the book she illustrated for Cynthia Rylant, All in a Day sight unseen (a first for me since it was an expensive hardcover book!) and was so happy to find that we LOVE it! 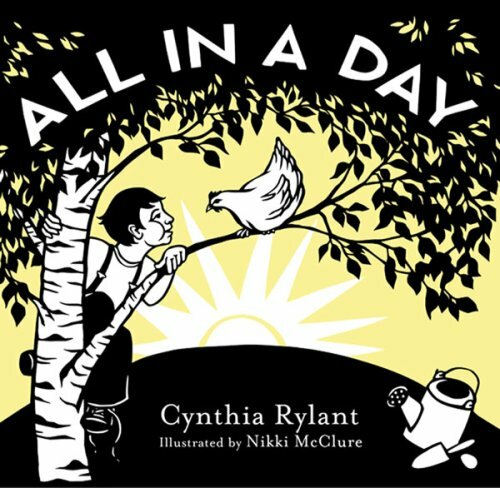 It is a sweet little book about seizing the day... a child's version of Father Stephen's recent post entitled Here and Now. I would recommend this book to anyone whether you have children to read it to or not! I'm starting to feel more in the mood to plan lessons and activities for our two older children (mainly because some rhythm to our days will help things go a bit more smoothly). I will elaborate on that more once I have more of an idea of what I am going to do. For now though, I thought that I would point out a site with vintage coloring pages that Barbara from Mommy Life mentioned on her blog. Sugar Plum really enjoys coloring and some of these pages are so sweet! It looks like there are some other nice things on the main page of the site as well!
. :Yesterday's feast day table with a photograph of Sugar Plum's Patron Saint:.
.:Cake for the namesday girl:. Did you go to see fireworks? In preparation for our baby's homecoming, we made Elizabeth's Marble Cake and Chocolate Frosting recipe. Yum! They were the perfect treat to celebrate our little one's birth and Father John's anniversary of ordination. What is your favorite recipe for cake or cupcakes? Things are going well for our family of five. Sugar Plum is such a little mama and cannot get enough of helping me take care of the baby. Little Man is feeling a little sad (though he loves his baby brother a lot!). Now that we have one full day under our belts and no place to go tomorrow (we have already had a doctor's appointment for the baby! ), we know what to expect from our day a bit more. My goals for tomorrow are to go outside a little (while baby is napping) to run off some energy and to do some more reading with the two older children. I am also hoping to get everyone down for a nap together... Mama is tired! I hope everything is going well for all of you!
. :The homecoming outfit laid out on the baby scale:. Our little baby is coming home!